Metsähallitus has published its Annual Report 2015. As part of the report, Metsähallitus is issuing a Corporate Social Responsibility Report that provides an extensive review of our operations and their social effects from the viewpoint of ecological, cultural, social and financial responsibility. Despite a slight decline in operating profit, Metsähallitus was able to meet most of its targets in 2015. 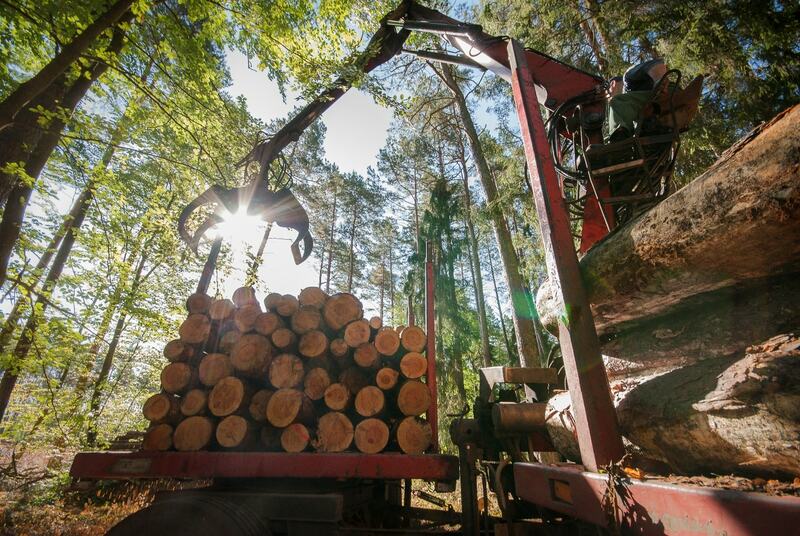 Forestry produces timber efficiently and responsibly on state-owned land for more than a hundred delivery locations. 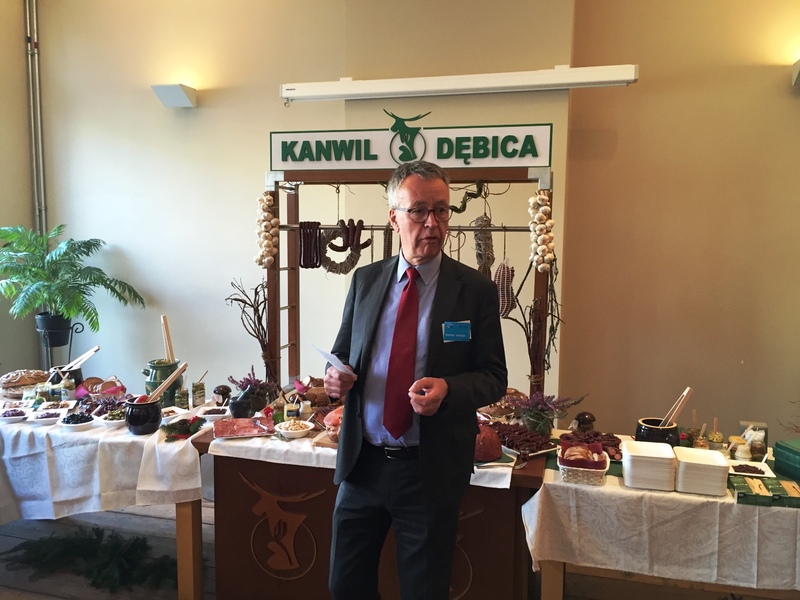 Metsähallitus has promoted ecological and cultural diversity with versatile measures. More and more people are interested in well-maintained protected areas as hiking destinations. The Annual Report 2015 can be downloaded at julkaisut.metsa.fi. It is also available in Finnish and Swedish. The Finnish version is also available in print. 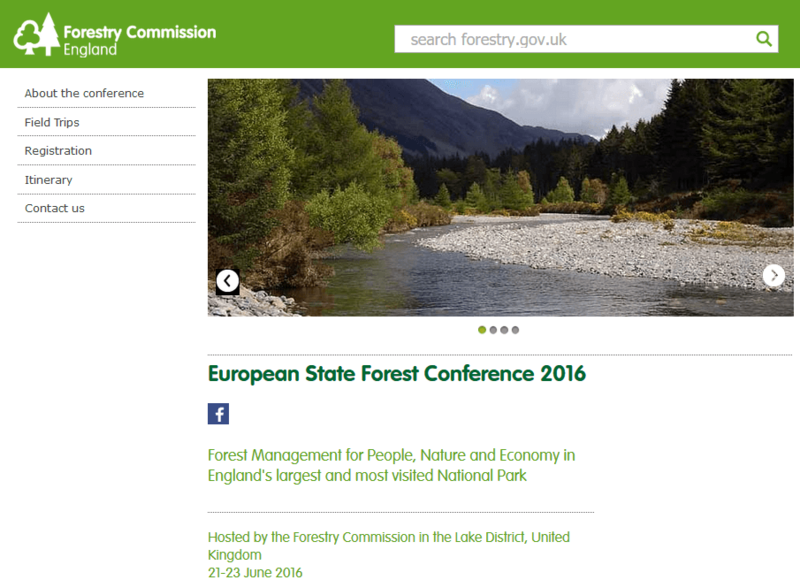 European State Forest Conference 2016 – Please Register! 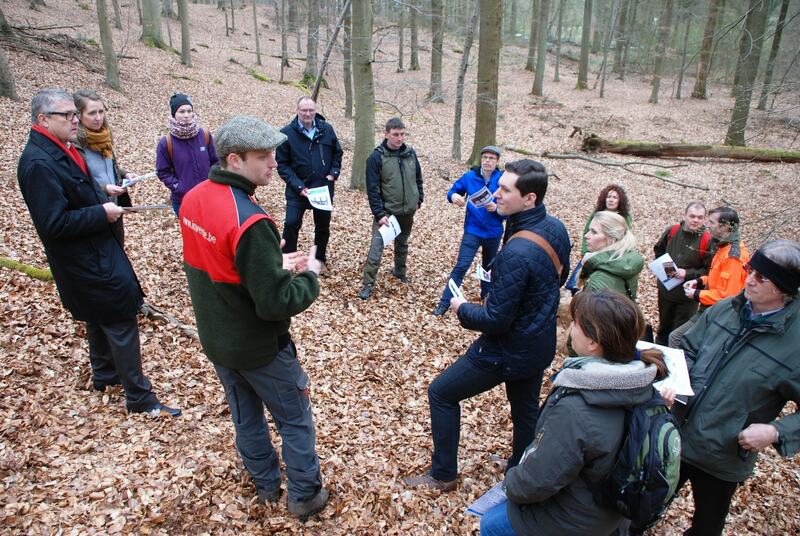 “Forest Management for People, Nature and Economy in England’s Largest and Most-Visited National Park” is the title of this year’s European State Forest Conference (SFC) hosted by the Forestry Commission, England. It will take place in the Lake District National Park – England’s largest national park, on 21-23 June 2016. Please Register by 30th April 2016! The Forestry Commission, England, has set up a website with all necessary information concerning the SFC. Please find here an invitation. 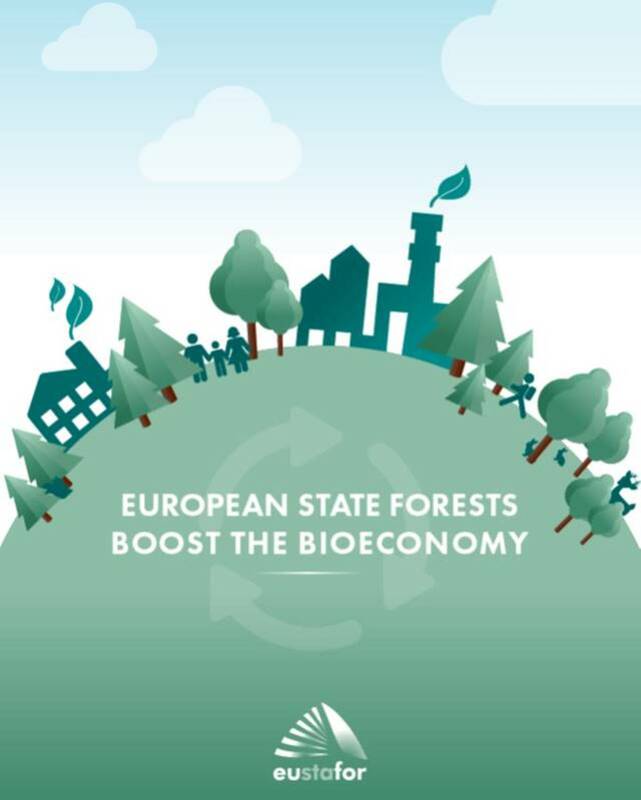 The European State Forest Association published a new booklet: “European State Forests Boost the Bioeconomy” to share state forests’ vision of the bioeconomy and explain the potential of European state forests to contribute to the development of this recent economic concept in the EU. 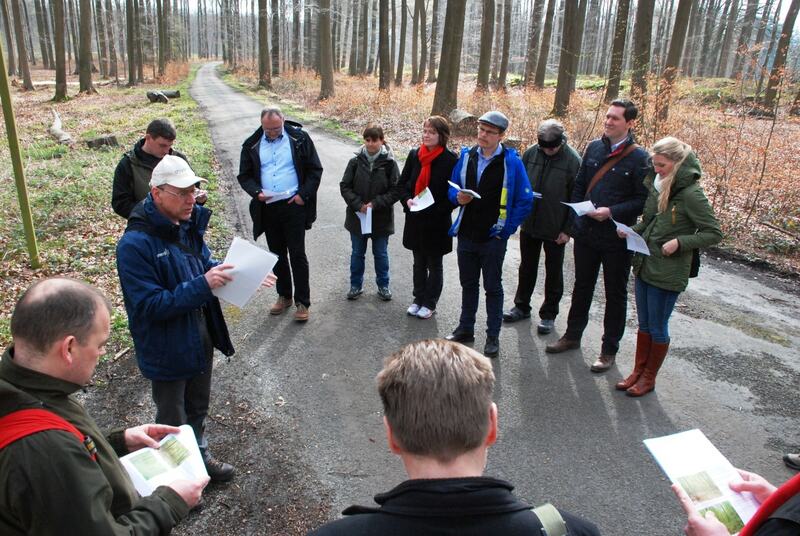 European State Forest Management Organizations, members of EUSTAFOR, can serve as reliable partners in achieving the goals set out by the European Union to build a competitive, resource efficient and low-carbon economy. 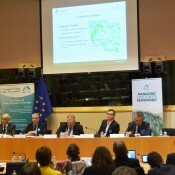 In addition to the significant contribution Europe’s forests already make to the economy, there remains a huge potential for more innovation and growth throughout the forest-based sector. 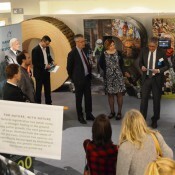 “This booklet is a short guide on how European state forests can play a significant part in developing both a greener, smarter, more efficient and inclusive European bioeconomy and a bio-based circular economy, using our available resources responsibly and efficiently for the sake of current and future generations,” states Per-Olof Wedin, President of EUSTAFOR. 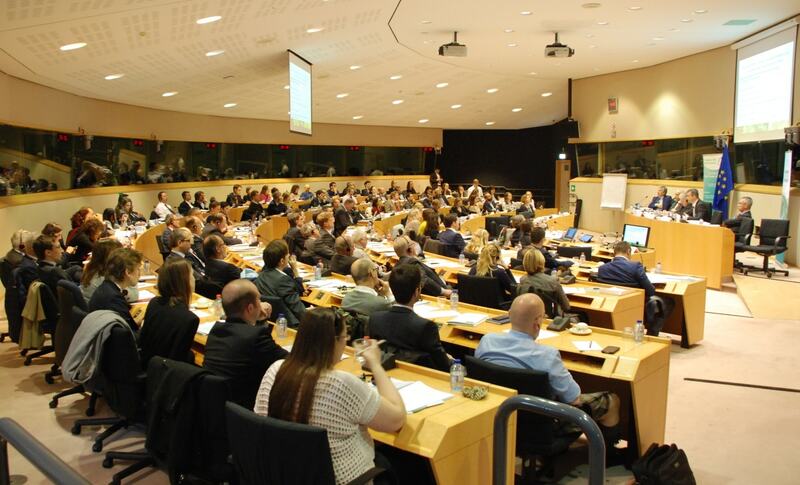 The publication is the first outcome of EUSTAFOR’s internal Working Group on the Bioeconomy that brings together experts from 10 of EUSTAFOR’s member organizations and its Head Office in Brussels. The booklet was published in April 2016, on the occasion of EUSTAFOR’s 10th anniversary celebrations which took place in Brussels. 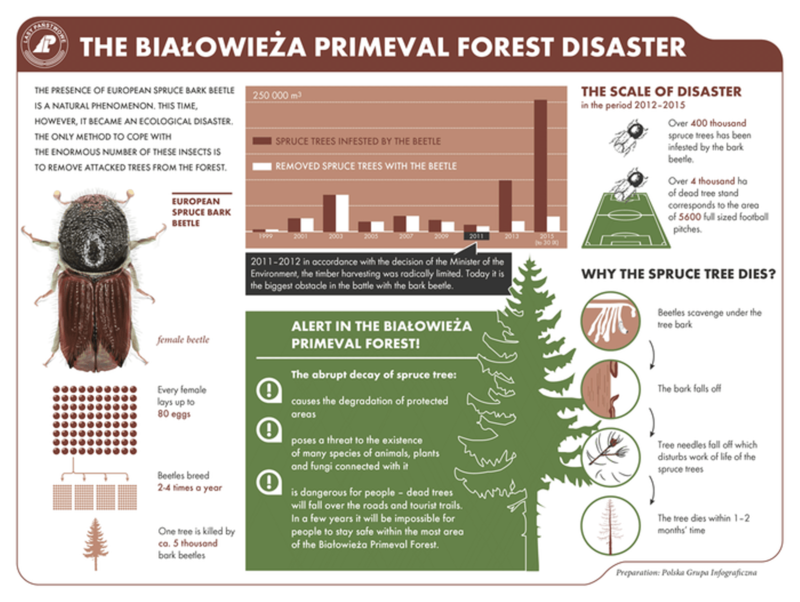 What you should know about the Białowieża Primeval Forest and the European spruce bark beetle that attacks it. What is happening in the Białowieża Primeval Forest? 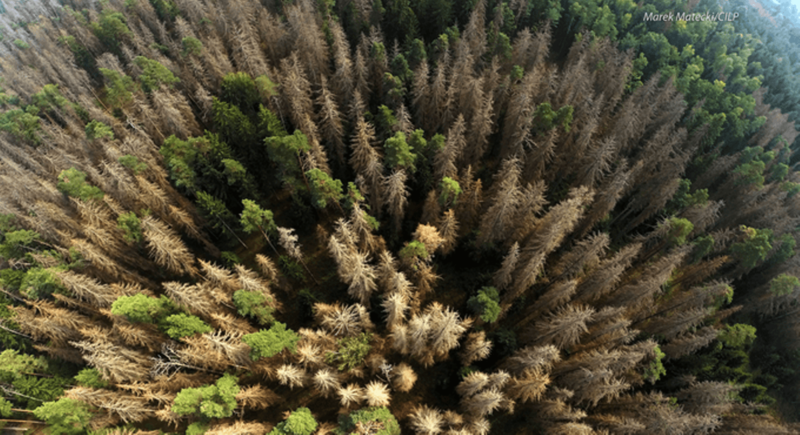 Spruce trees that are attacked by the bark beetle massively die in the Białowieża Primeval Forest. This is the biggest reported invasion of bark beetle since many decades. Until this day ca. 500 thousand trees, within the area of three forest districts, have fallen prey to this insect. It means that 4 thousand out of 52 thousand ha of tree stands, that are looked after by foresters, are dead. Trees die also in reserves located within the area maintained by the State Forests and in the Białowieża National Park. The bark beetle scavenges on limber under the tree bark which leads to tree’s death even within one month. Normally the insect attacks old and weakened trees, however, this time its gradation (i.e. 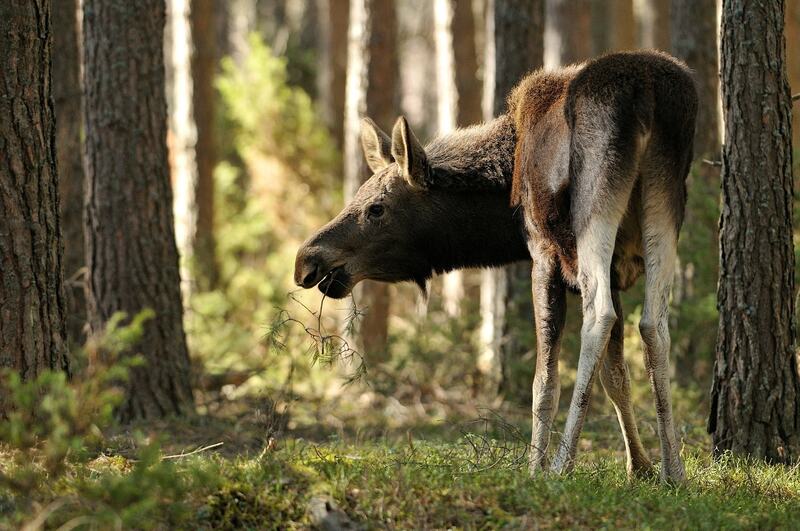 count increase) is so big, that even young, healthy and strong trees fall prey to the insect. It is important to remember that the bark beetle already has begun to attack other tree species, for example pine tree and larch. 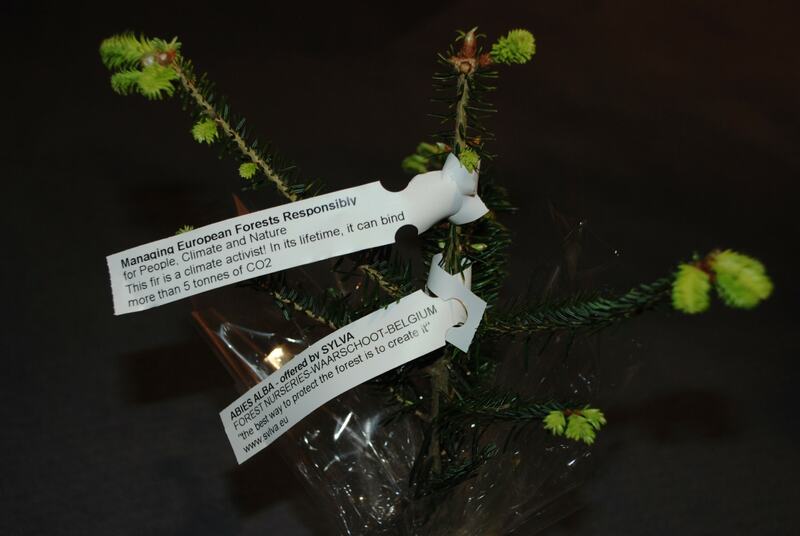 Why do foresters want to cut down attacked spruce trees? Because it is the only effective way to limit the extent of bark beetle gradation when it attacks on such a large scale. Trees that are already colonized by the bark beetle are cut down and removed from the forest in order to disable the transfer of the insects to healthy tree barks. Foresters want to leave the majority of those dead trees that are no longer inhabited by the bark beetles until their natural decay. The bark beetle gradation appears periodically, irregular in dimension, yetuntil now it has always been under control because foresters have been removing attacked trees from the forest. However, in the period 2011-12 the Ministry of the Environment limited the timber harvesting in forest districts and in consequence it was impossible to stop the gradation expansion – the number of trees colonized by insects grows rapidly. In order to limit the gradation; the bark beetle spread will continue unless the attacked spruce trees are logged and removed from the Białowieża Primeval Forest (spruce tree constitutes 30 % of the Białowieża Primeval Forest tree stands). Current bark beetle gradation also endangers precious habitats protected under law pursuant to Nature 2000, for example subcontinental oak-hornbeam forest – foresters are responsible for its preservation. for safety reasons: dead oak trees within few years after death fall over. If they are not felled, a/o along roads and trails, they will pose threat to people. As a consequence it would be necessary to impose exclusion order, prohibiting from entering to the Białowieża Primeval Forest. Only the logging of dead spruce trees will enable to introduce renewals (natural and man-made), which in several dozen years will erase the bark beetle trail. Without the human help, the restoration of the Białowieża Primeval Forest would last much longer. Where possible, foresters want to initiate natural renewals. 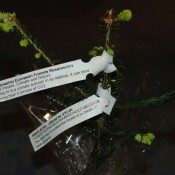 Where it is impossible to use natural measures, foresters will conduct man-made renewals – foresters will seed cuttings of various forest’s species that come from seeds obtained from specially selected trees from the Białowieża Primeval Forest. 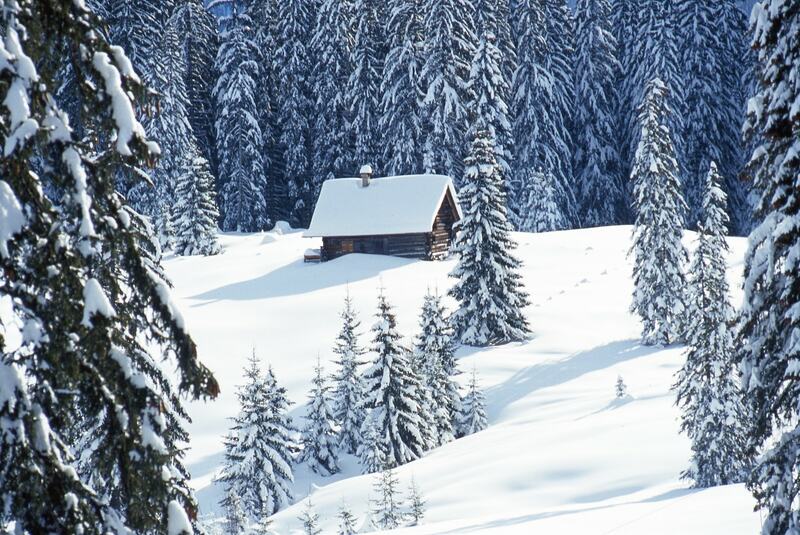 Why don’t foresters want to leave spruce trees on their own, as ecologists propose? Ecologists claim that the bark beetle plague is a natural phenomenon and the nature will cope with it on its own. They want to let the bark beetle spread to other spruce trees, so that the spruce trees will fall over and the forest will renew on its own. The only problem is that the current bark beetle gradation, has not be present on such a large scale for a very long time. The insect will destroy the whole area of the Białowieża Primeval Forest. In a few years’ time it will be hazardous to enter such area because of dead trees fall-over. Expansive grass (for example small reed) will replace trees when they will already have fallen over – this view is also shared among ecologists. These grass create thick and dense bark layer that will make the fragile tree seedling impossible to break through it. In that way for decades before trees battle the grass, vast parts of the Białowieża Forest would resemble steep, not a forest that we are used to know. Therefore, according to foresters, ecologists propose conducting a hazardous experiment on the Białowieża Primeval Forest. 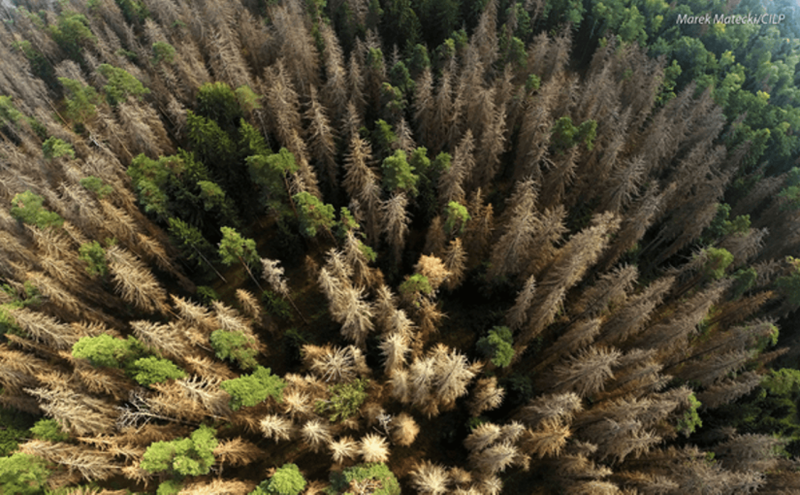 Similar experiments are being conducted by Czechs within the area of destroyed by the bark beetles Šumava National Park, and Germans in Bavarian Forest National Park. Moreover, Polish ecologists want to conduct this experiment within the whole area of the Białowieża Primeval Forest – the most precious forest in Europe. Who will take responsibility if the experiment ends up in failure? 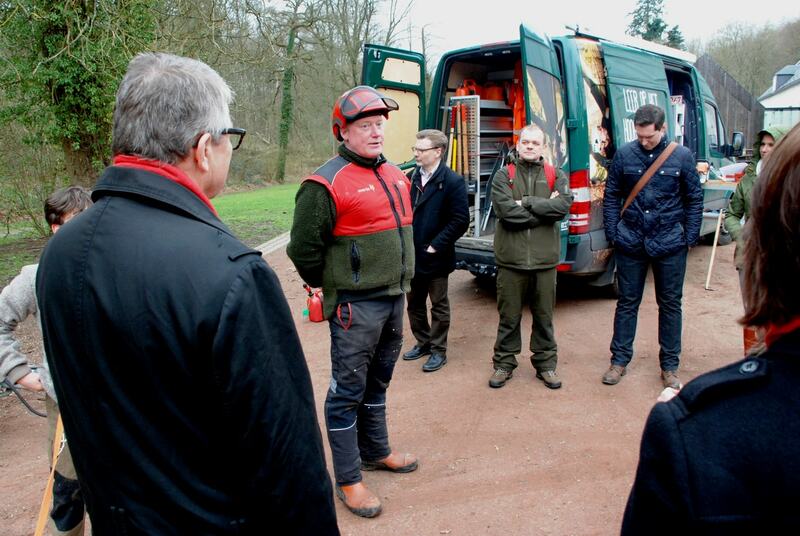 The answer is – foresters, by virtue of the law. In similar disasters human has always helped the nature in order not to irreversibly lose precious animal and plant habitats. Secondly, the obligation of conducting active forest protection, in this case active fight against bark beetle, is imposed on foresters by regulations, precisely the Forest Act. The Art. 9 says that in order to ensure the general forests protection, their owners (in case of The State Forests foresters that manage forests on behalf of the Treasury) are obliged to: structure the balance within forest ecosystems, increase the natural resistance of tree stands, and especially: to prevent, detect and combat the spread and appearance of harmful organisms. Another Article says that in case of occurrence of harmful organisms to the extent that it endangers the persistence of tree stands, the forest manager performs combative and protective treatments. 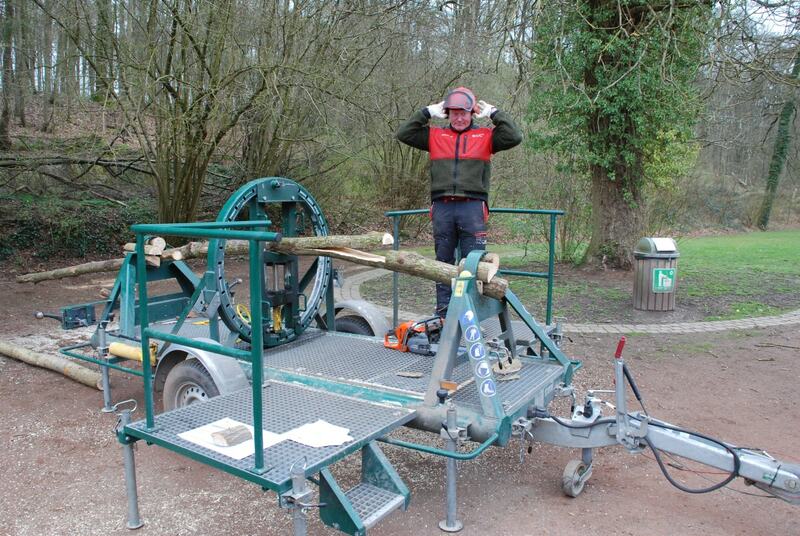 Where will foresters perform logging? It needs to be emphasized that the foresters’ demand involving increase in logging does not concern the area of the Białowieża National Park. It concerns a small part of timberlands that constitute fragment of the Białowieża Primeval Forest, which covers total area of 150 thousand ha, and 65 thousand ha lies on the Polish side. The State Forests maintain the area of ca 50 thousand ha of the Białowieża Primeval Forest, and tree stands of the Białowieża Forest District, that tries to obtain consent to log attacked trees, constitute 12 thousand ha. However, major part of these grounds cover reserves and hydric and pioneer habitats excluded from usage. Therefore, dead spruce trees would be logged only within other grounds – total 7 thousand ha that constitute ca. 5 percent of the whole Białowieża Primeval Forest area. Can bark beetle gradation be stopped? It is impossible to completely stop the gradation of bark beetle, because it would require logging all attacked spruce trees, also those that grow on protected grounds including the National Park grounds. 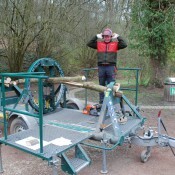 Moreover, logging shall take place before spring comes when insects start scavenge again. 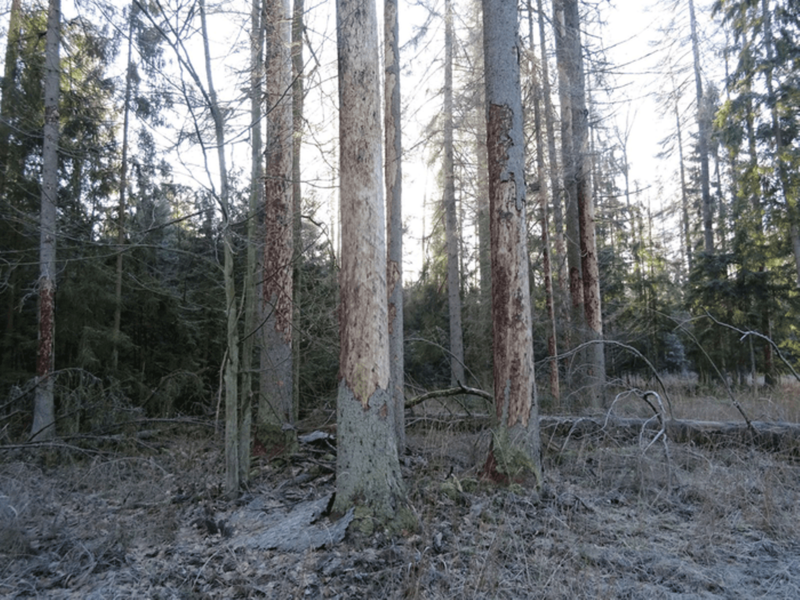 However, even logging of the part of attacked spruce trees that grow on the area managed by the State Forests, will reduce the spread of the plague to other tree stands. It is essential to remember that bark beetles that scavenge on one tree are able to attack 30 other trees, and these attacks may occur four times a year. How much money will the State Forests earn on the spruce tree logging? The Browsk, Hajnówka and Białowieża Forest Districts are profitless. All 430 Forest Districts of the State Forests contribute to forestry fund, that finances such deficient units as Białowieża Forest Districts. When foresters ask for introducing an amendment to the forest management plan, they have in mind the good of the Białowieża Primeval Forest, not the economical income. Money, that must be spent by the State Forests on the dead tree logging, removing them from tourist traces and carting those trees that are inhabited by insects and pose a real threat to other trees, will be equal to the revenue from sales of colonized by bark beetle timber, that can be used only as a firewood. Dead trees that are abandoned by bark beetles will be left in the Białowieża Primeval Forest until their natural decay. Only a part of them will be logged and pulled away – those that grow by tourist traces or roads and pose threat to people. Will foresters log spruce trees ‘to the core’? Not in the vast majority. They will log only dead spruce trees or those colonized by the bark beetle, posing threat to a/o people. At the worst, in those areas where trees that grow side by side are lodged on a bigger scale, the so called nests will be created. In the majority of cases only single trees will be lodged. It is important to remember that all areas, where the logging will take place, are going to be renewed: where it is possible – in a natural way, in other areas – with human help by planting new trees. Is Białowieża Primeval Forest really primeval? Forest that was not modified by a human can be called primeval. Natural forest, on the other hand, is a forest that was also not planted by a human, however, it may be used in a moderate degree. There is a dispute that concerns whether within the area of the Białowieża Primeval Forest can be found fragments of primeval forest, because human has been using it for a thousands of years. The most similar to primeval forest is the 5 thousand ha area within the territory of the Białowieża National Park, where logging has been forbidden since tsarist times because it was a game refuge. The Białowieża Primeval Forest, within the territory maintained by the State Forests and thanks to the sustainable forest management, had survived in its natural state. For example, within the territory of the Białowieża Forest District one – third of the Białowieża Primeval Forest area constitute reserves. Another 34 percent of the District’s territory, where trees are also not logged, constitute tree stands considered to be over 100 years old. Within the remaining one – third of the district’s forests, about 25 percent of tree stands, that constitute usage hydric and pioneer habitats, are excluded from usage. However, even the remaining 2800 ha of the Białowieża forests are managed in a different way in comparison with the rest of the country’s forests. For example, within the territory of the closes national park there are not performed clearcut harvests, heavy equipment is not used and the renewal is only natural. Moreover, within the area of all three Białowieża Primeval Forest districts, the level of logging is much lower than within other forest districts in Poland. 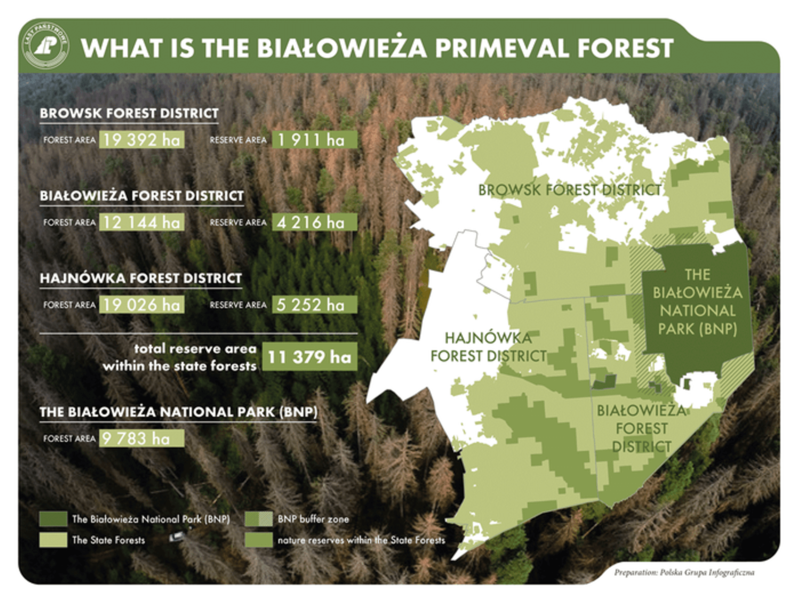 Why the whole area of the Białowieża Primeval Forest was not integrated into the national park? Foresters are not a party in regard to extending the Białowieża National Park. This decision rests with the Minister of the Environment. The State Forests, just as the Białowieża National Park, are subordinate to the Ministry of the Environment and are to implement national forest policy. It is evident that every decision made by the Ministry is respected by us and the State Forests shall conform to it. However, we believe that the State Forests have been maintaining the Białowieża Primeval Forest area successfully for over 90 years. Demands regarding integrating these grounds to the national park are the best evidence. They stem from the fact that these forests were, and after 90 years still are highly biodiversified. 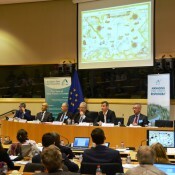 The conference was organized in the European Parliament (EP) under the auspices of the three Chairs of the EP Committees which are the most relevant for the forest sector, namely: MEP Czesław Adam Siekierski (Committee on Agriculture and Rural Development), MEP Giovanni La Via (Committee on Environment, Public Health, Food Safety) and MEP Jerzy Buzek (Committee on Industry, Research and Energy). 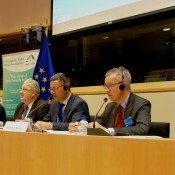 MEP Paul Brannen (S&D/UK) co-hosted the event. 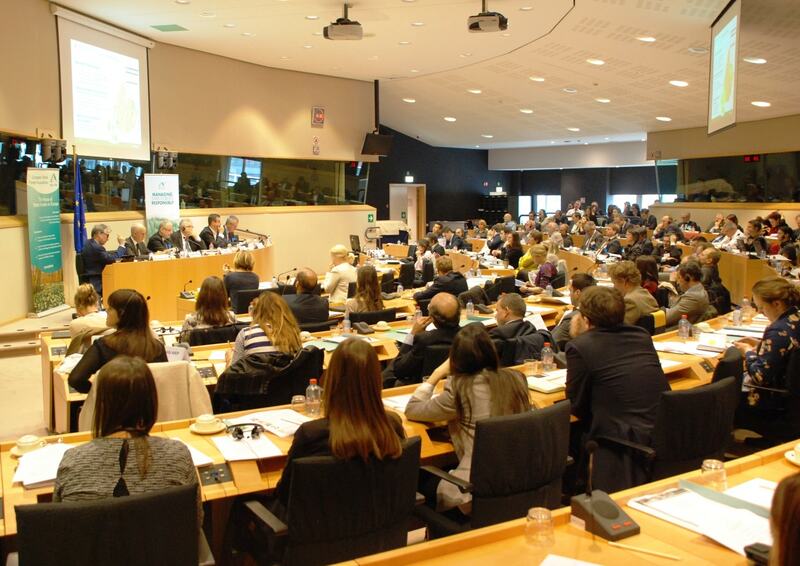 Several presentations were made, followed by a stakeholder panel discussion during which the potential of European forests to contribute to the goals set out by the EU’s 2020 strategy, the EU’s 2030 climate and energy framework and the Paris Agreement (COP-21) were highlighted. 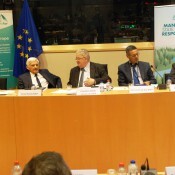 MEP Siekierski referred to the role of forests in protecting water resources as well as being an important contributor to the development of rural areas. 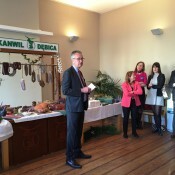 He announced the upcoming work of the three committees on their joint report regarding the EU Forest Strategy. 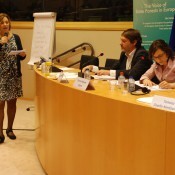 MEP La Via stated that managed forests have a higher capacity to sequester carbon than unmanaged forests. He also pointed out that forest fires and other damage can be prevented by properly designed management practices. 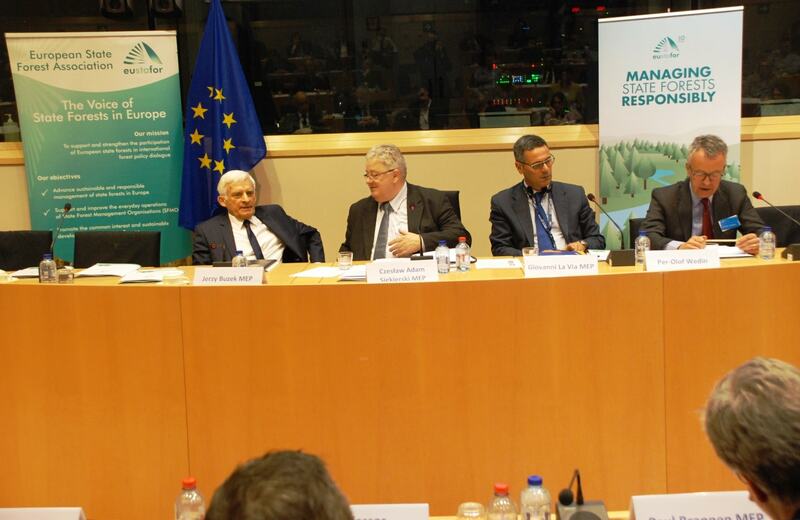 MEP Buzek underlined that forests have a great potential to contribute to the bioeconomy and the circular economy and that industry and forest policies must be designed horizontally. Prof. Gert-Jan Nabuurs (Wageningen University, Netherlands) delivered the keynote address about the new role for forests and the forest sector in achieving the EU post-2020 climate targets. He pointed out that European forests are currently a sink for 10% of the EU’s total emissions and that there is an additional 9% CO2 mitigation potential if the carbon storage of forests is increased by applying so-called climate-smart forestry practices. State forests can play a significant role. They are large entities who manage substantial areas and are capable of providing many examples of climate-smart management practices. 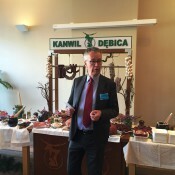 Prof. Tomasz Zawiła-Niedźwiecki, Deputy Director General of the Polish State Forests, explained how climate change influences daily management practices. He presented the concept of “Forest Carbon Farms” that can serve as a functional network of areas promoting forest management activities which enhance CO2 mitigation efforts. 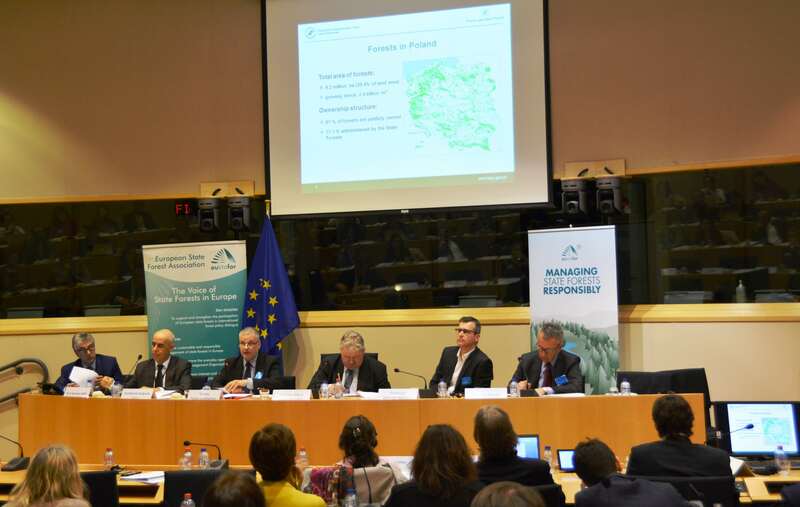 Prof. Zawiła-Niedźwiecki highlighted that additional forestry activities play an important role in increasing greenhouse gas removals and that national legislation and monitoring systems should enable the experimental marketing of removal units. Mr. Humberto Delgado Rosa, Director Natural Capital, European Commission (DG Environment) stated that biodiversity and forest management can be reconciled if sustainable forest management is practiced. 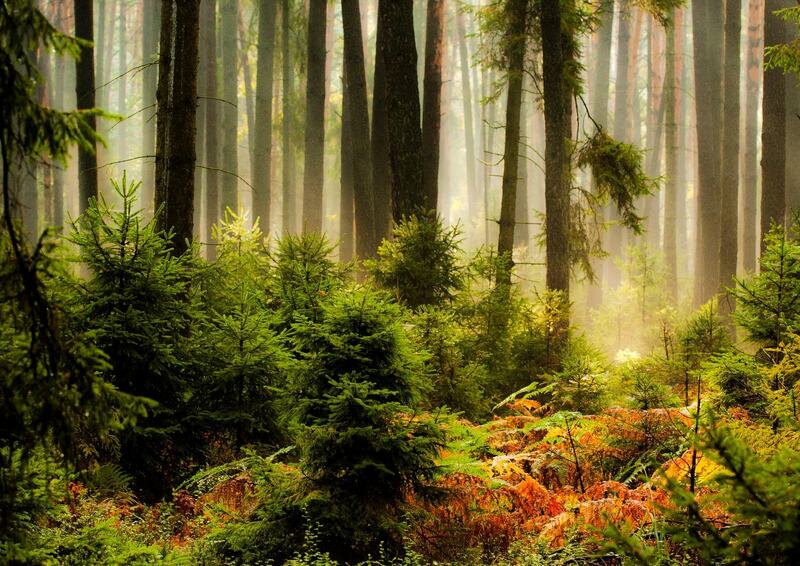 Forests are Europe’s largest type of ecosystem in a relatively natural and semi-natural state. Around ¼ of the EU’s forests is part of Natura 2000. He quoted the State of Nature in the EU report (2015) according to which most forest types and forest-related species are in an unfavorable conservation status. Mr. Delgado Rosa stated that forest owners and managers need to be encouraged and rewarded for keeping up sustainable and multifunctional forestry that also offers green job opportunities and enhances biodiversity. 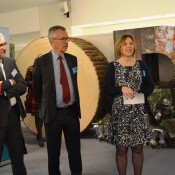 MEP Miapetra Kumpula-Natri said the bioeconomy was an effective tool against climate change and noted that state forests play a key role in the bioeconomy. Wind and solar energy are very important but 25% of renewable energy comes from biomass derived mostly from forests. 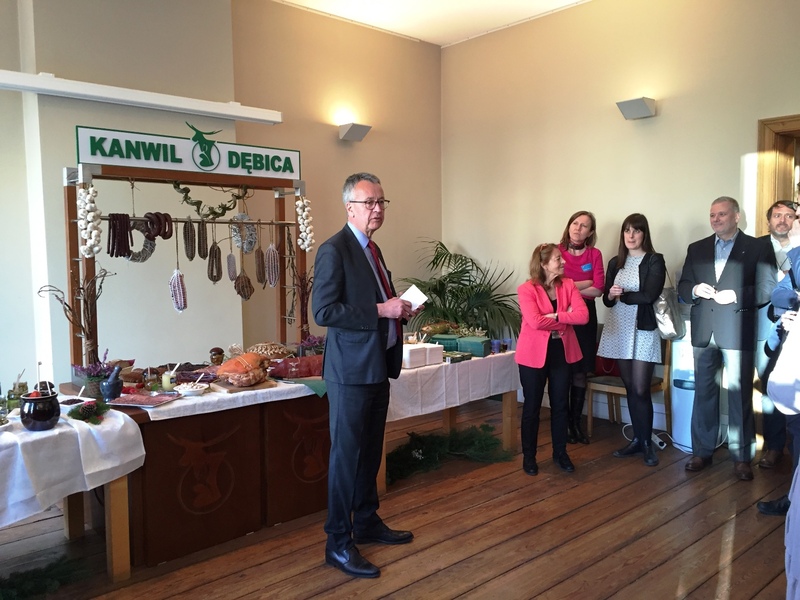 Decarbonization of the economy and the energy union are not possible without biomass. 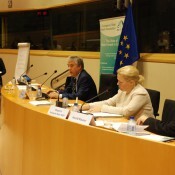 Ms. Kumpula-Natri emphasized that the EU’s bioeconomy should primarily be built on domestically-produced raw materials and called for a policy framework that attracts investments. 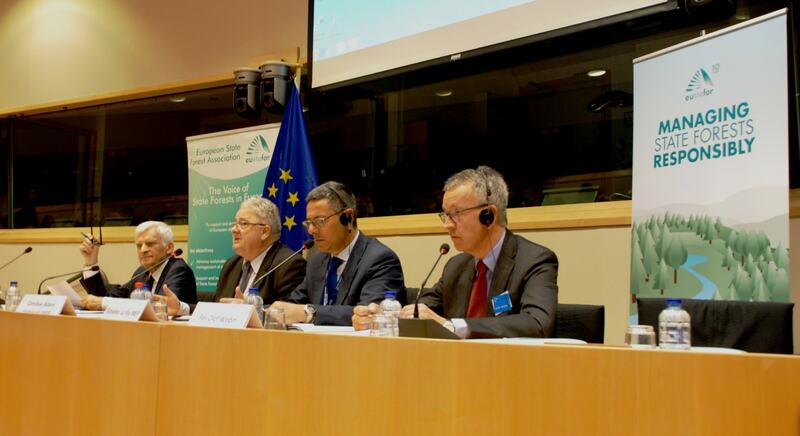 MEP Paul Brannen, Harald Mauser (EFI), Luc Bas (IUCN), Fanny-Pomme Langue (AEBIOM) and Pekka Pesonen (Copa-Cogeca) joined in subsequent panel discussion which tackled the following questions: Should Europe increase the production and use of wood raw materials? How can biodiversity and other ecosystem services be maintained if, for climate reasons, forest production is increased? 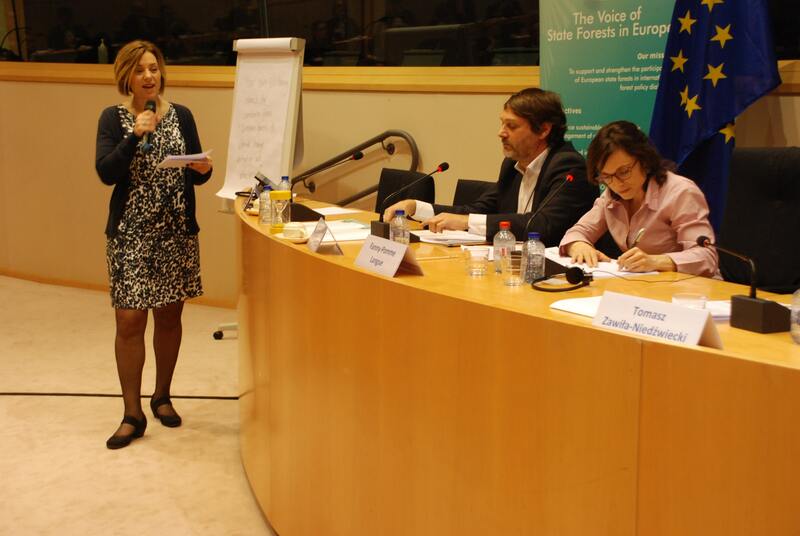 What would be the best solution for forestry in the EU’s post-2020 climate change policy? 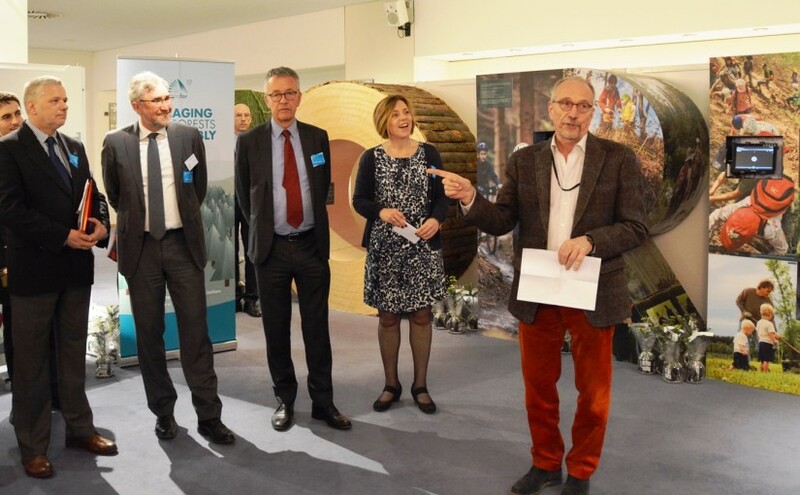 Per-Olof Wedin, EUSTAFOR’s President, stated that over the past 10 years EUSTAFOR contributed with state forests’ experience and knowledge to the EU’s major forest-relevant policy developments. 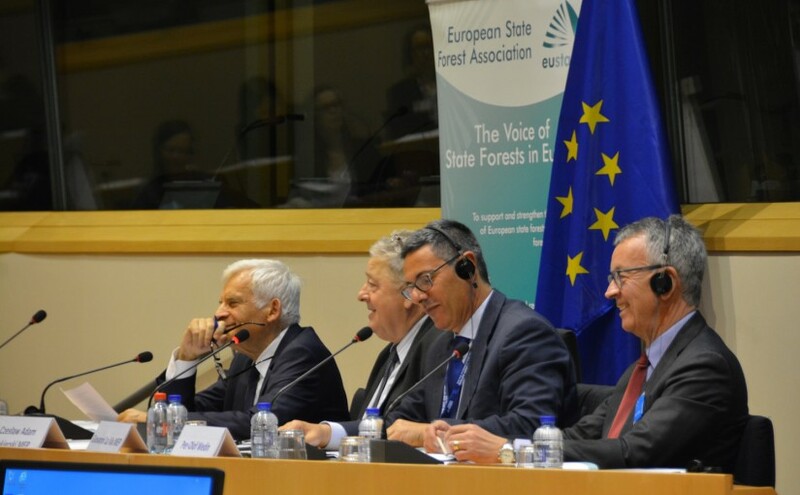 Today, EUSTAFOR would like to offer its views on how state forests can boost the bioeconomy and how sustainable forest management can contribute to other policy developments driven by the need for climate change mitigation and adaptation. 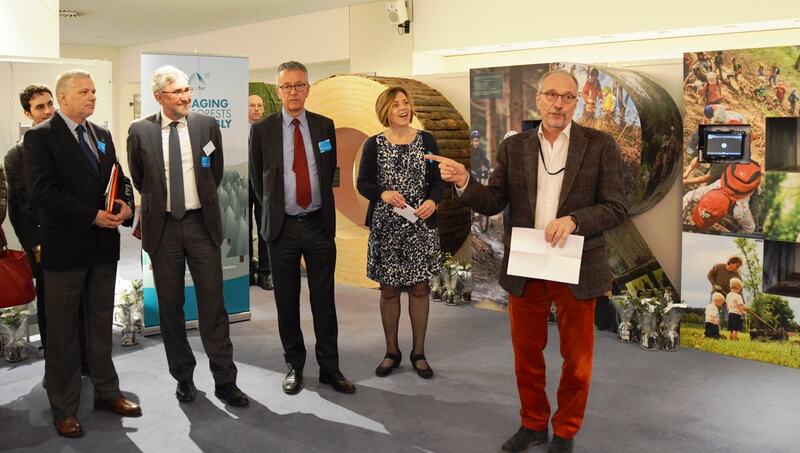 The conference was followed by the opening of an exhibition by MEP Nils Torvalds (ALDE/Finland). 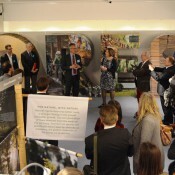 The exhibition was on display during the entire week in the European Parliament and presented different aspects of sustainable and multifunctional forest management in European state forests. For more information (programne, list of speaker, presenetation…) click here. 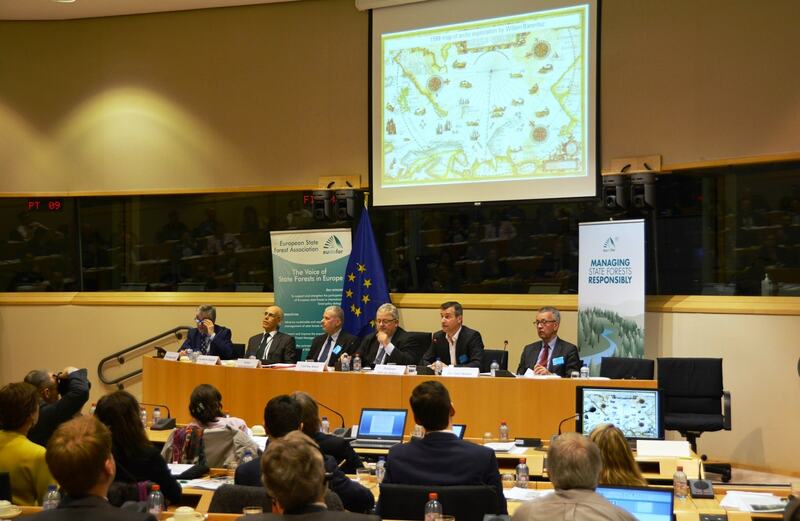 EUSTAFOR participated as a strategic partner in the “Forest City Project” which is a campaign to communicate the value of forests, to connect urban societies with green spaces and to encourage people to reconnect with nature by visiting forests. 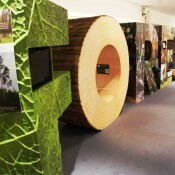 One main component of the project is a series of 10 large cubes covered with pictures of forests. 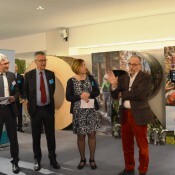 The exhibition was first displayed on the esplanade of the European Parliament building for two weeks starting on March 21, the International Day of Forests. 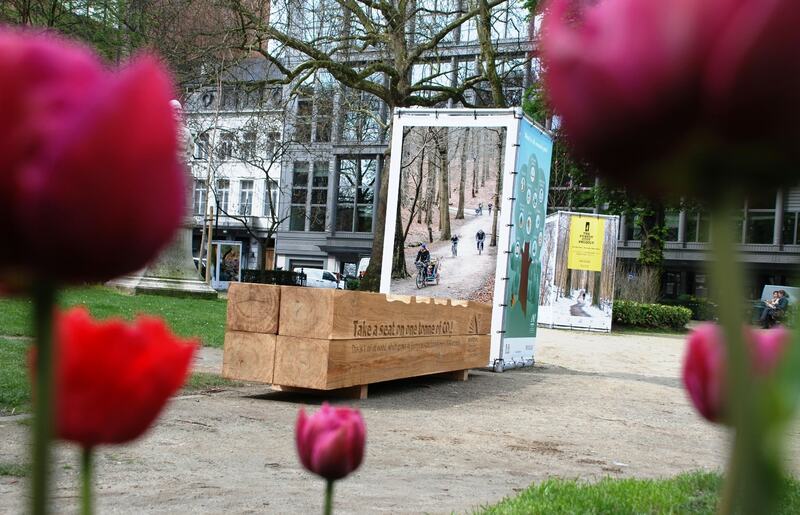 Afterwards the cubes were moved to Square de Meeûs, a very busy park in the European District of Brussels, located only a few steps down the street from the European Forestry House. 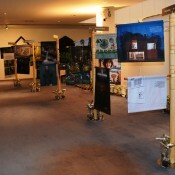 They will remain on display there until June 5, the World Environment Day. This highly original exhibit shows not only the beauty of the forest but also its multi-functionality. 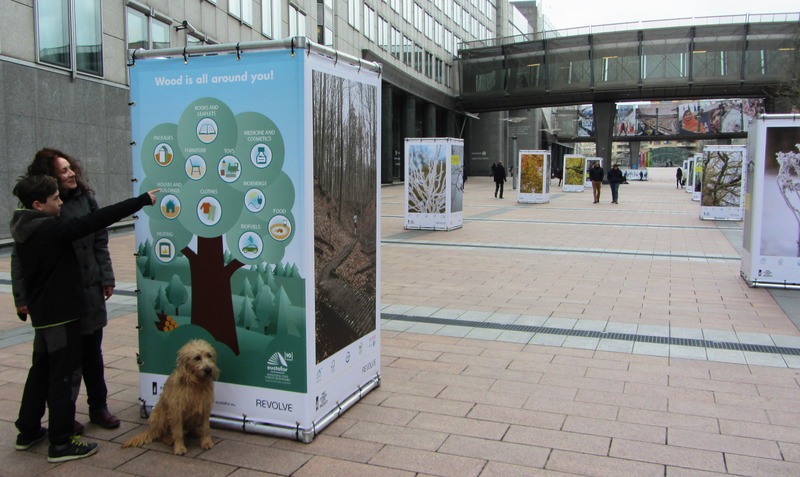 A poster “Wood is all around you!” was designed in cooperation with EUSTAFOR’s Communicators Network. 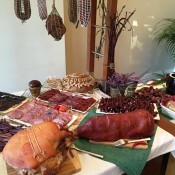 It illustrates a variety of products that are used by people every day and which are derived from wood. EUSTAFOR’s poster, located at the entrance to the park, is highly visible and is on display next to another EUSTAFOR exhibit. 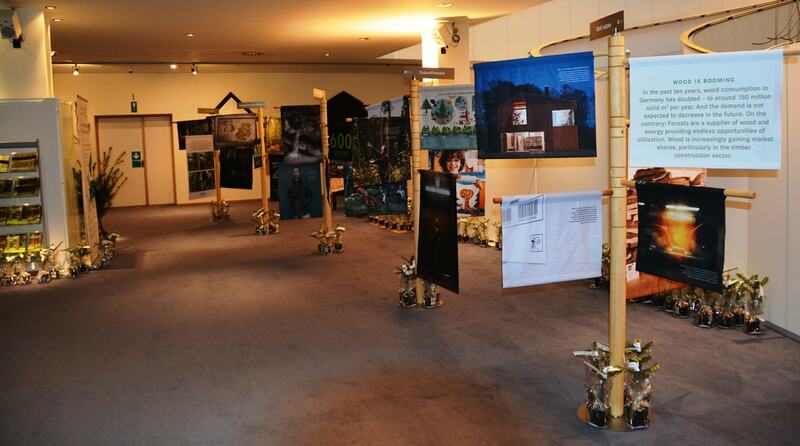 All the pictures of the “Forest City Project” can be viewed online. 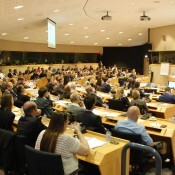 Click here to consult the comprehensive conference documentation. 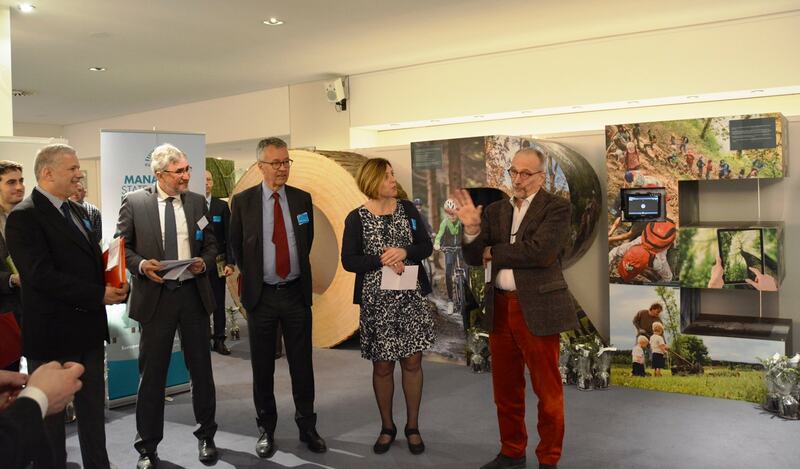 The exhibition will present different aspects of sustainable and multifunctional forest management in European state forests. 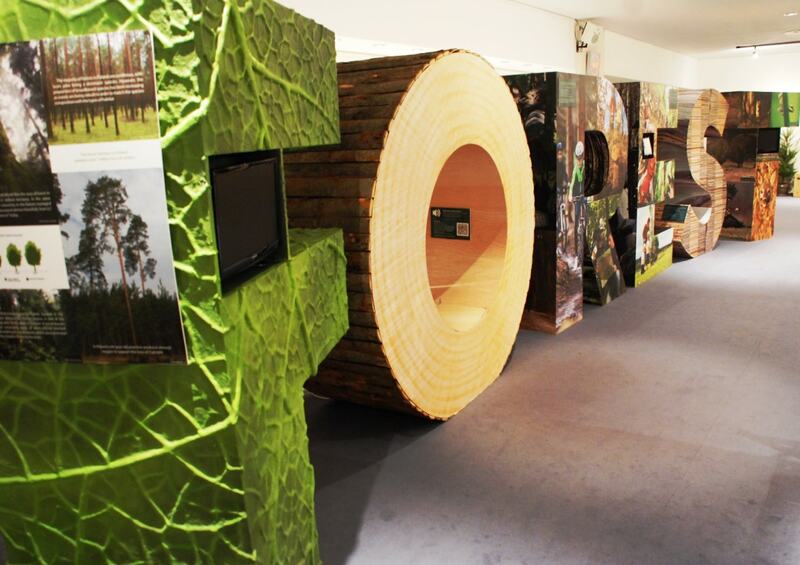 Exhibits kindly provided by Poland State Forests, Latvijas valsts Meži (Latvia) and the Bavarian State Forest Enterprise (Germany). 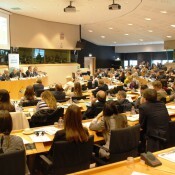 Both the conference and the exhibition are organized with the support of the European State Forest Association (EUSTAFOR) and the European Parliament Intergroup on “Climate Change, Biodiversity and Sustainable Development”. 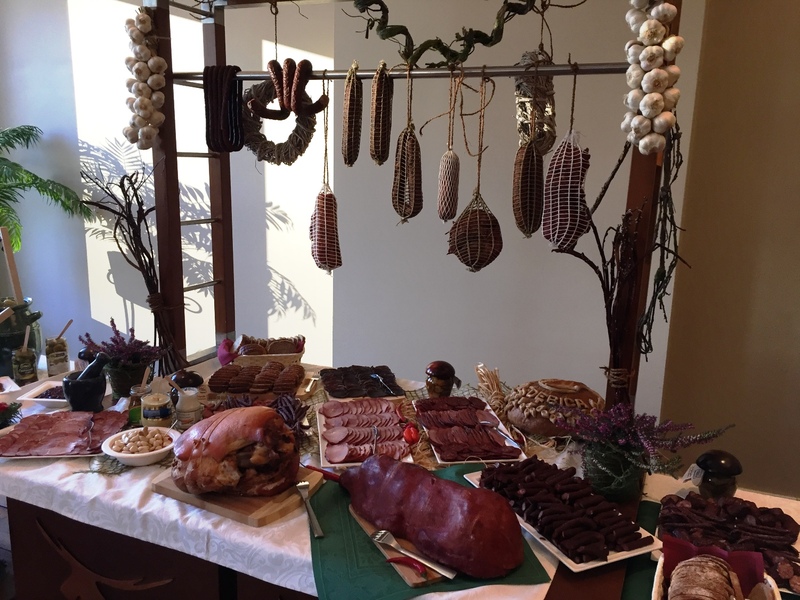 Click here to see all pictures and texts of the Bavarian exhibit. 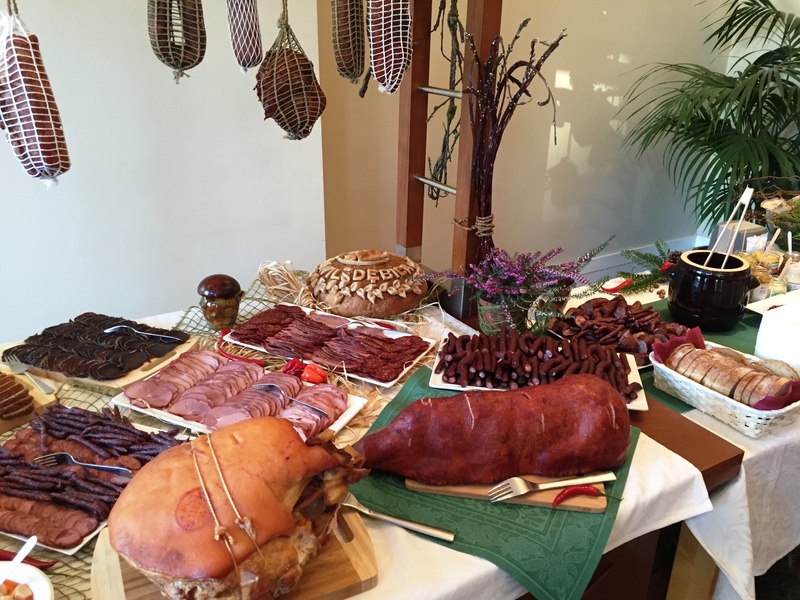 The Forest Reception is organized with the support of Poland State Forests offering a variety of traditional venison of different game and forest related drinks. 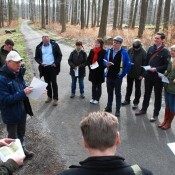 The forest excursion to the Sonian Forest on 6 April is organized by EUSTAFOR and its Flemish member, Natuurinvest, to show the manifold functions of the forests. 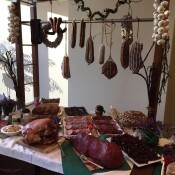 It will end with a lunch of venison and other products from the forest. (Bus will leave at 14.00, returning to the Place du Luxembourg). Click here for the initial presentation. 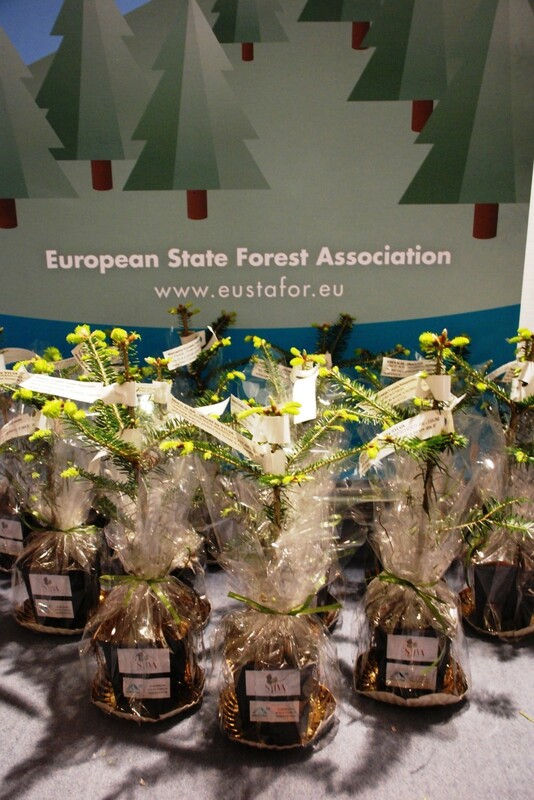 With these three events, EUSTAFOR is highlighting the potential of European forests to contribute to the goals set out by the EU’s 2020 strategy, the EU’s 2030 climate and energy framework and the Paris Agreement. 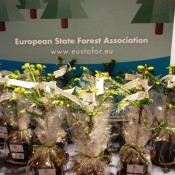 The events will coincide with celebrations of the 10th anniversary of cooperation among state forest organizations at European level. 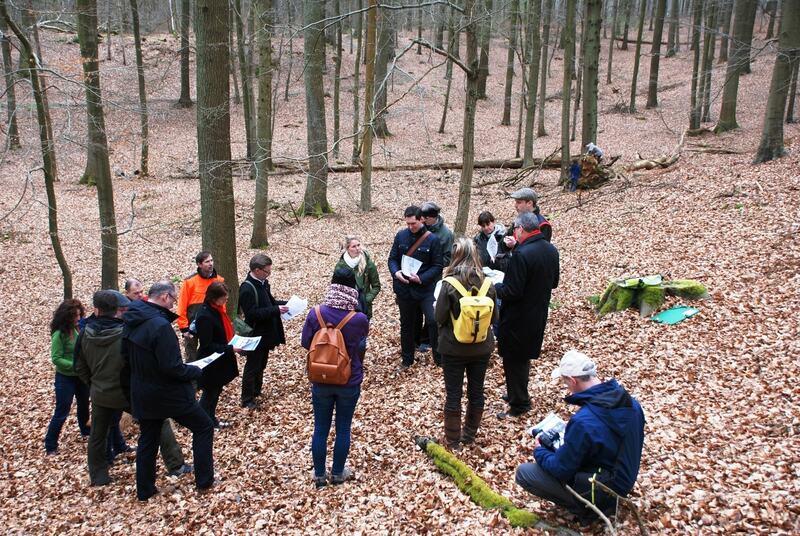 EUSTAFOR contributed to the “Revolve Magazine” with an article about sustainable and multifunctional forest management as practised in European state forests. Is it possible to take a seat on CO2? 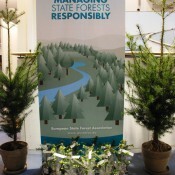 On the occasion of EUSTAFOR’s 10th anniversary, the Brussels office launched a number of promotional campaigns to raise the awareness of various target groups about the contribution of sustainable forest management for people, climate and the nature. Thanks to its Latvian member, Latvijas Valsts Mezi, EUSTAFOR was able to allow the population of Europe’s capital to not only see but actually feel what 1 ton of CO2 looks like! 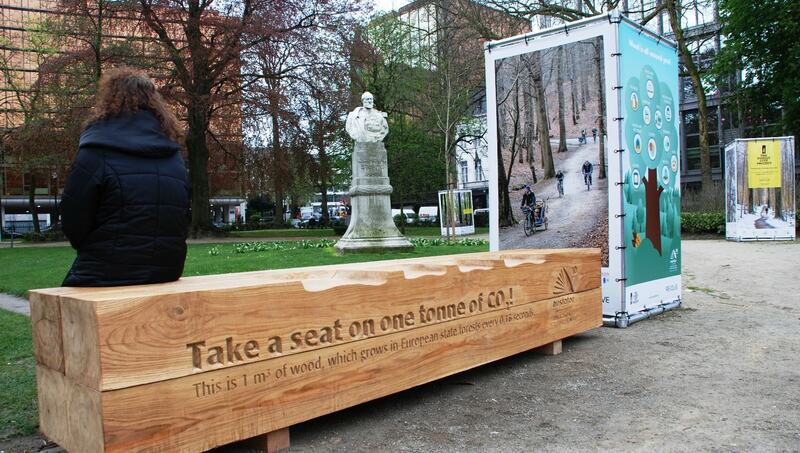 A solid oak wood bench was placed right at the entrance of Square de Meeus where, for 2 months, visitors to this green oasis in the busy European Quarter will be invited to “take a seat on one tonne of CO2.” On the 1 m³ bench it is explained that it contains 1 ton of CO2, which grows in European state forests every 0.16 seconds. 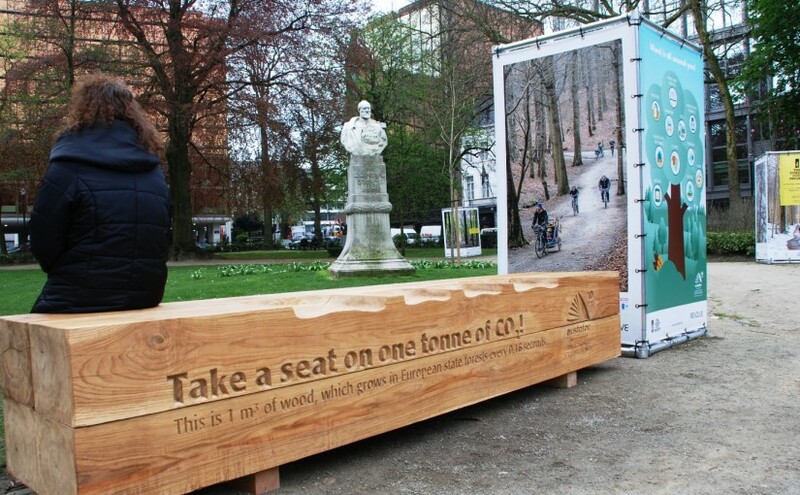 The bench will remain in the park until World Environment Day on 5 June 2016. More than 1/3 of Europe is covered by forests, providing a wealth of natural resources, delivering important economic, environmental and social values for the benefit of all Europeans and an enormous potential to mitigate climate change. 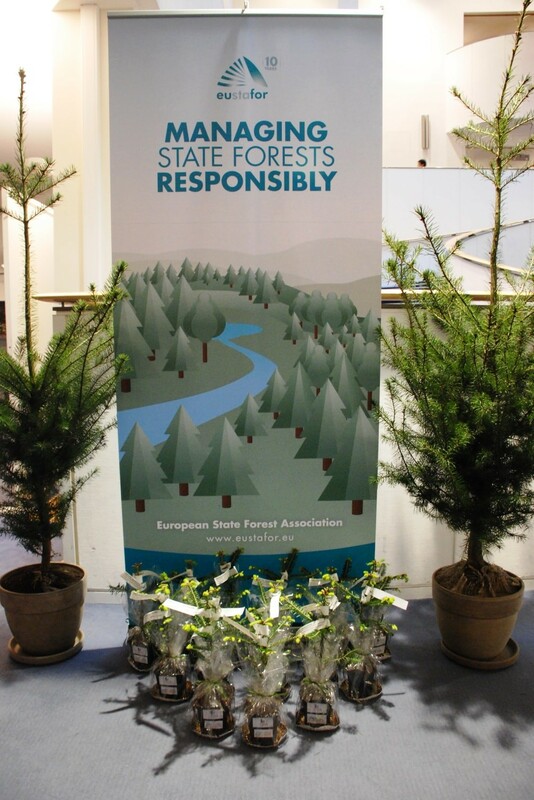 Up to 1/3 of Europe’s forests are owned by States, which means that they belong to the citizens of Europe! 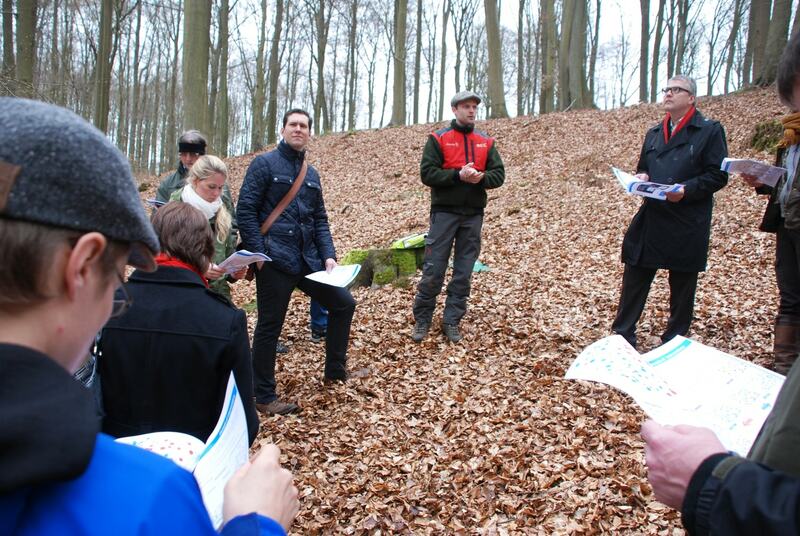 State Forest Management Organizations look after Europe’s forests and practice multifunctional and sustainable forest management of the highest standards for the benefits of all. Managing forests sustainably means to manage and use the forests in such a way that future generations will benefit from forests as much as, and possibly even more than, we do now. Their biodiversity, productivity, regeneration capacity and vitality are maintained while leaving all interconnected ecosystems intact. Forests that are managed sustainably will maintain their potential to fulfill relevant ecological, economic and social functions. The functions of forests are manifold and often the same forest area needs to provide a mix of functions simultaneously. Forests are habitats for many plants and animals and they provide a very high degree of biodiversity. At the same time, they are beautiful places for recreation, such as hiking and jogging, for observing nature and for children to play and explore. They deliver oxygen and filter the air, their roots store and filter water. Growing trees absorb CO2 and thereby mitigate climate change. The forest is a working place for many people. The harvesting, processing and use of the wood from forests contribute to rural development and jobs. 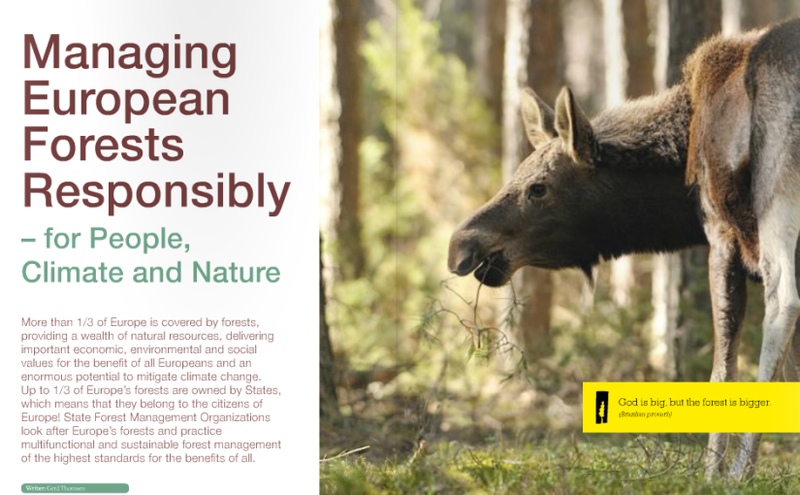 The above are just some examples of the many functions our forests provide and why sustainable forest management is an essential part of achieving Europe’s economic, environmental and social objectives. Forest management practices are adapted to diverse policy goals and social expectations. These vary from one forest to another. In forests close to cities, for example, forest managers will pay special attention to the need for recreation areas whereas in forests with very high diversity and rare species, conservation is especially important. Other forests are valued for their high productivity or the role they play in controlling erosion. The main focus of a forest’s function does not mean that other essential functions are neglected. 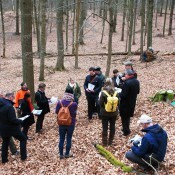 Sustainable multifunctional forest management, as applied in European state forests, aims to balance the complex and sometimes conflicting sets of demands on forests, for the benefit of all. Use Wood! Mitigate Climate Change! Forests play a key role in the mitigation of carbon emissions. It is estimated that EU forests and the forest sector currently contribute with an overall climate change mitigation impact that amounts to about 13% of total EU emissions. Forests and good forest management are the most cost-effective options to reduce emissions and contribute to the goals of the ambitious Paris Agreement that aims to limit the global temperature increase to well below 2°C above pre-industrial levels by the end of the century. Growing trees take up carbon dioxide from the air through photosynthesis and store carbon in their woody structure during the growth period of their life cycle. As a tree matures, its rate of growth slows down, and the amount of CO2 sequestration decreases until the rotting wood of a dead tree releases CO2 back into the atmosphere. The ideal time for harvesting varies mainly in function of the intended use of the wood and the lifetime of a tree which can range between approximately 50 years for fast growing species such as birch to more than 200 years for slow growing species such as oak. 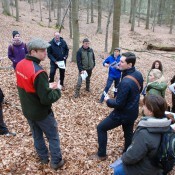 Forest managers are able to regulate the harvesting and the regeneration of trees through adjusting appropriate silvicultural techniques, boosting the CO2 sequestration rate of forests while maintaining the many other social, cultural, economic and environmental services they are expected to provide. They contribute to reducing fossil emissions and strengthening low-carbon economic growth. As long as forests are managed sustainably, the overall CO2 balance on a landscape scale will be positive. In addition to being a renewable raw material, wood has a great potential to store carbon in numerous wood-based products that can replace energy-intensive materials. After a tree is harvested, it continues to act as a carbon store when it is used in such traditional industries as construction, furniture, pulp and paper, as well as the many new bio-based industries which have emerged in recent years. According to scientifically proven estimates, every cubic meter of wood used as a substitute for other building materials reduces CO2 emissions to the atmosphere by an average of 1.9 tons of CO2 equivalent. 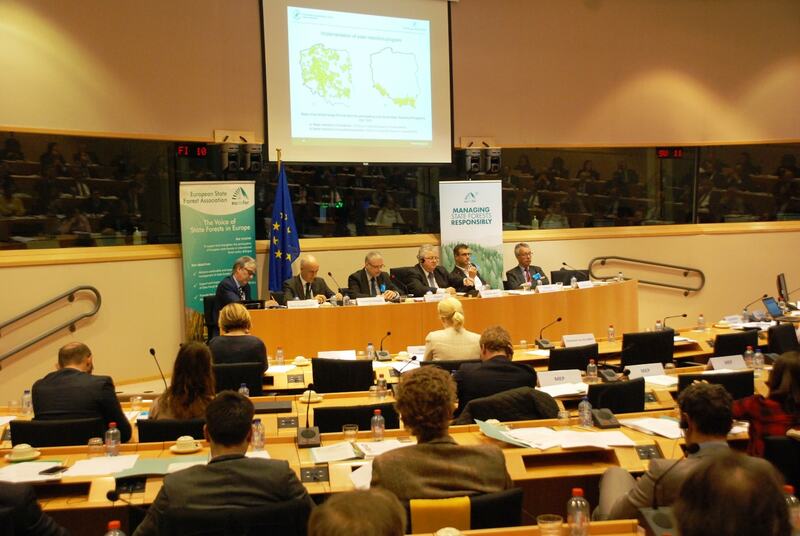 Woody biomass from forests and residues is the largest source of renewables in Europe. 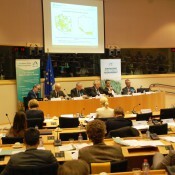 Bioenergy currently represents 60% of the EU’s total consumption of renewables. Using modern wood-based energy carriers (liquid, gas, wood chips or pellets) made from harvesting and industrial residues from sustainably managed forests is climate smart compared to the use of fossil energy. The majority of bioenergy is generated from biomass that originates from sustainably managed forests. It can be used for heating, electricity generation and transport fuels. Wood for use as an energy source comes not only in the form of residues from final tree harvesting but also from thinning and other sustainable forestry practices. Wood for energy use can also be derived as a by-product from the downstream processing of wood by manufacturing, for example in the form of off-cuts, trimmings, sawdust, shavings, wood chips or by-products of the pulp industry. End-of-life wood and paper products can also be used as a source of energy. 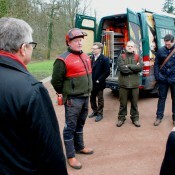 Managing forests, harvesting trees, processing timber and manufacturing wood products provide jobs to many people thereby playing an important role in the economic development, employment and prosperity of Europe, particularly in rural areas. 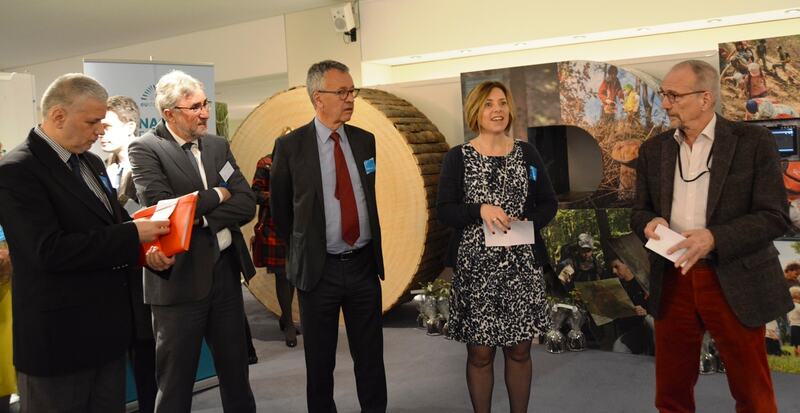 EUSTAFOR members harvest around 1/3 of the 400 million m³ timber logged annually in the EU. But more than 800 million m3 of wood is used in the EU every year. European state forests have a significant unused resource since only approximately 60-70% of the annual growth in state forests is made available for wood supply. 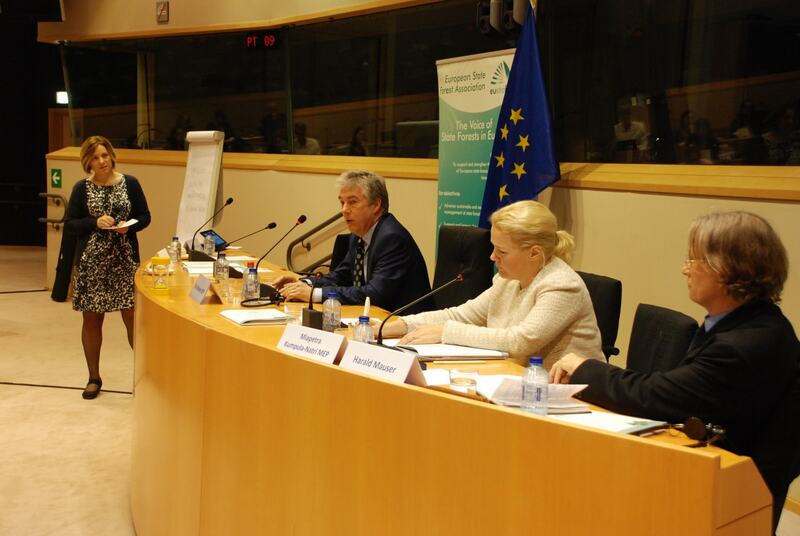 They therefore have a great potential to contribute towards building a resource efficient and green European economy. 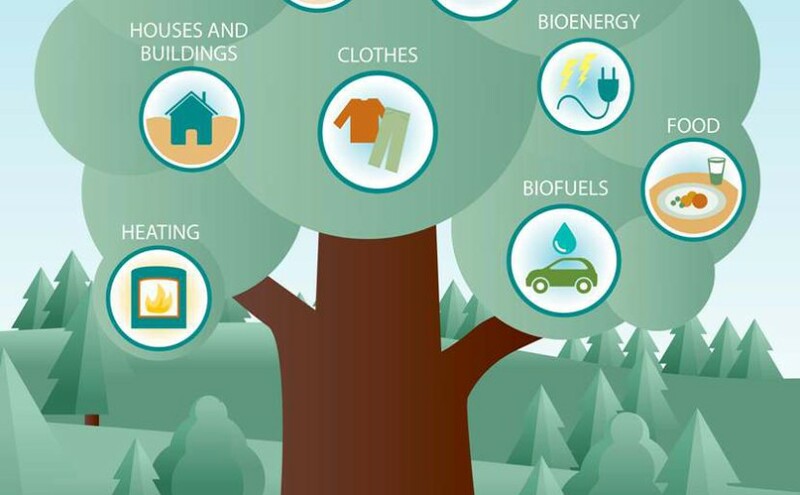 Increasing the use of domestically produced biomass can help diversify Europe’s energy supply, providing energy security, create economic growth and jobs and lower greenhouse gas emissions. 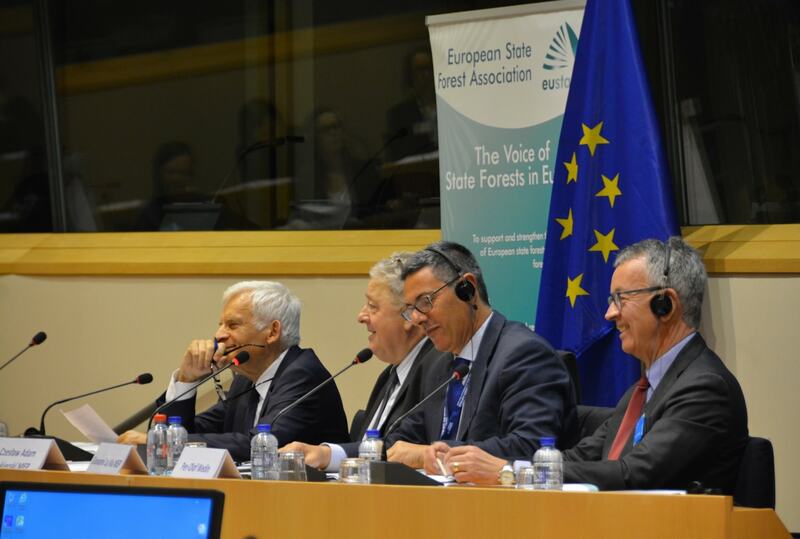 A wise, sustainable utilization of Europe’s forests is key to finding solutions to major issues within the EU and worldwide. 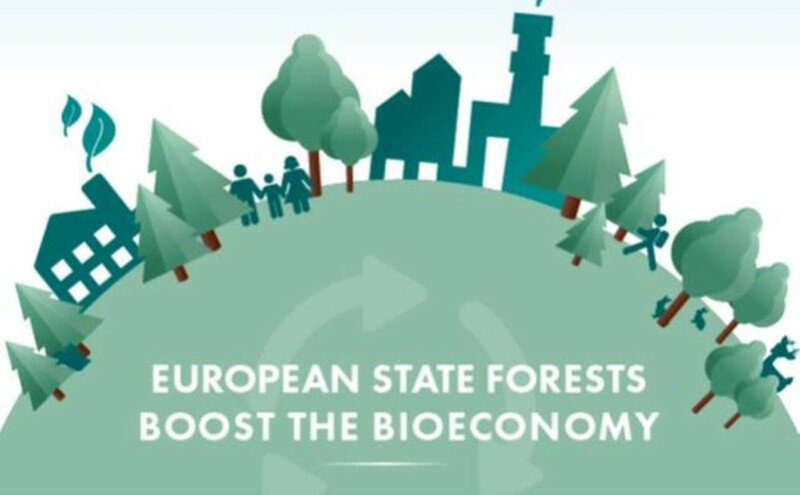 European forests have a role to play in working towards achieving the goals set out by the European Commission in its Bioeconomy Strategy (2012) and 2050 Low-Carbon Economy Roadmap. Apart from a few rare exceptions, forests in Europe have, throughout the centuries, been influenced by human activity. Sustainably managing these semi-natural forests can provide an even higher degree of biodiversity than natural forests at times. In most cases, forest management is not only compatible with the conservation of biodiversity, but actually actively contributes to its maintenance and enhancement. Harvesting and thinning operations open up the forest canopy, allowing more light to reach down through the lower levels of the forest, encouraging dormant seeds to germinate, providing light for plants to grow and flower and warmth for cold-blooded animals. This type of forest management mimics natural dynamics and promotes tree species that would otherwise not have a chance to thrive. There are always some trees that are excluded from harvesting because they serve as habitat trees for birds, beetles and other animals that live in their holes. Some trees are allowed to decay in order to provide the rotten wood necessary for the survival of wood pickers and stag beetles. It cannot be overstated how important Europe’s forests are for biodiversity. 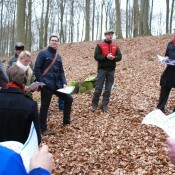 European state foresters have a wide experience of integrating biodiversity conservation into their forestry practices. This is reflected in the fact that around half of the total area of the European Natura 2000 network – the largest network of protected areas in the world – consists of forests, most of them in state forests. The Natura 2000 network protects Europe’s most valuable and threatened species and habitats and almost 40% of European state forests are protected and protective forests.